Sunday’s televising of “Oprah’s Next Chapter” featuring Fairfield and Transcendental Meditation is expected to generate interest in the community. A number of initiatives are under way to aid tourists and potential visitors. Involved parties include Fairfield officials, Fairfield Area Chamber of Commerce, Fairfield Arts & Convention Center, Maharishi School, M.U.M., Maharishi Vedic City, Maharishi Foundation, David Lynch Foundation and Ideal Community Group. The convention center is developing a self-guided tour for visitors. A one-day training session for volunteer ambassadors also is in the works. The welcome and information center at the Maasdam Barns site on Highway 1 South is expanding its hours. Plans are under way to open the Taste of Fairfield visitors’ weekends in May and June to those who don’t practice the Transcendental Meditation technique. Planning also continues for M.U.M’s Experience the Self event to be held July 10–22. 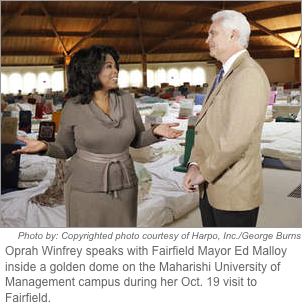 Oprah visited Fairfield Oct. 19 to film for the hour-long program. It airs on the Oprah Winfrey Network at 8 p.m. Sunday. Locally, O.W.N. can be accessed on channel 203 on Mediacom, channel 279 on Direct TV, channel 90 on Lisco and channels 189 and 885 on Dish Network. Student Activities at M.U.M. is hosting a viewing of the program at Dalby Hall in the Argiro Student Center. Doors open at 7:30 p.m.
For more information about the program, visit www.oprah.com/own. Addendum: Members of the Fairfield community are invited to a live viewing of Oprah’s New Chapter, Sunday, March 25, at 8 pm CT (doors open at 7 pm) at the Sondheim Theater, Fairfield Arts & Convention Center. Free Admission – First come first seated. What does it take for rural Iowa to succeed? That’s a question Iowans ask every decade when the U.S. Census delivers the message that the state’s rural population continues to shrink while urban areas expand. The 2010 Census was no exception, reporting that since 2000, 66 of the state’s 99 counties lost population. Success recognized only by the rise or fall of population paints a bleak picture for rural Iowa. Experts who analyze the topic, however, say population numbers don’t tell the whole story. And there isn’t just one story to tell about how communities thrive; there are many. Stories of leadership, vision, and strategic planning. 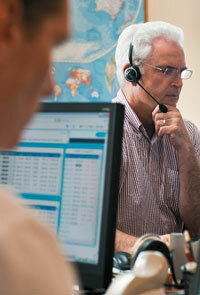 Stories of collaboration and passionate volunteers. Stories of loyalty and advocacy and neighbors who roll up their sleeves and get the work done. More studies will be conducted, more books will be written, and the debate will continue. Meanwhile, three small rural Iowa communities are thriving — creating success on their own terms. It’s midday on a Wednesday, and you may have to circle the town square twice to find a parking spot. Men in business suits and 20-somethings with computers crowd sidewalk tables outside restaurants and coffee shops. Yes, there’s the old Gimble’s jewelry store. Yes, there’s the familiar brick courthouse. But present also are the Ayurvedic cuisine, the aromatherapy, and the Jingui Golden Shield Qi Gong. Fairfield offers an unusual-for-Iowa blend of traditional and new cultures. Maharishi University has put Fairfield on many people’s maps, but community-wide changes in the last decade have been a force for transformation in this southeast Iowa town of 9,464. Jefferson County’s county seat today boasts a diversified business economy that emphasizes entrepreneurship, the arts, and sustainability. You can still drive from one edge to the other in about five minutes; however, Fairfield doesn’t feel rural. 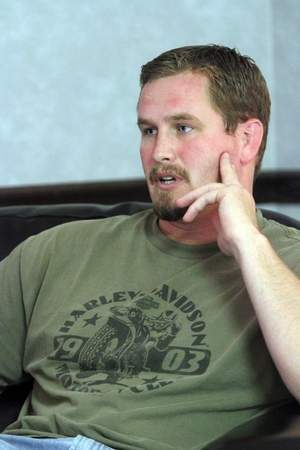 As in Elkader and Adams County, it’s attitude, not population numbers that drives success. The new ideas generated by all the new immigrants— from across the United States and around the world — created challenges for traditional Fairfield. Malloy acknowledges that Fairfield was once viewed as a split community. “That image is 85 percent gone,”he says. Getting everyone to the table helped. Fairfield, with less than 9,500 residents, doesn’t feel rural. Diversity, culture, and sustainability permeate the town, where Revelations Cafe (above) attracts a steady crowd for vegan pizza and organic espresso. Broad community participation was what Malloy was after when he initiated a visioning process for the community shortly after he was elected. Malloy brought in the University of Northern Iowa Institute for Decision Making to assist. Planning started in 2002 and took 18 months. Malloy contends the planning process helped the community “grow, develop, mature, and gracefully integrate into a whole,” uniting a community once split. Collaboration was critical to making the new Fairfield Arts & Convention Center (FACC) a reality. Fairfield groups had talked for years about the need for a permanent performance space. Community theater productions were staged in the fairgrounds livestock arena. The arts group had lost its studio space when the library moved. “It was time to have a nice space everyone in the community could use,” says Suzan Kessel, a visual artist on the arts association board. So 10 years ago, Kessel joined with another longtime Fairfield resident, Sally Denney of the community theater, in leading a community-wide visioning process to turn talk into reality. A board of 12 reached out to the chamber, hospital, schools, businesses, and the meditation community to get input. “We had a very well-balanced board from the beginning,” says Kessel, ensuring all voices were heard. The process was not without conflict, however. Possibility stems from harmony, says Mayor Ed Malloy (above, brokering fuel as President of Danaher Oil Company). He initiated a visioning process that brought together longtime residents like Suzan Kessel and Sally Denney with Fairfield newcomers like FACC executive director Rustin Lippincott. In another segment of old meets new, the 1960s-era Parsons College organ has been restored by Dan Glass and John Connet and installed in the 21st-century Fairfield Arts & Convention Center in 2009. Some in the meditation community wanted the building to adhere strictly to Sthapatya Veda architectural principles. Many fiscally conservative, traditional Fairfield residents were concerned the town would be saddled with a white elephant few would use. Today’s FACC is more than either Kessel or Denney imagined, both in terms of space and the way that space represents the community. The $10 million facility — built with the financial support of 1,100 individuals and companies — includes a 522-seat theater, an art gallery, office space, and meeting rooms that make the site attractive for private music and cultural events as well as for regional conventions. Acts that take the Center’s stage range from local dance recitals to mixed martial arts, comedy, Way Off Broadway (Iowa’s only professional music theater company), and professional touring companies. Other parts of the facility are busy with class reunions, wedding receptions, and business meetings. 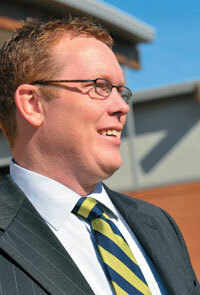 Staying focused on strategic priorities, says Malloy, positions Fairfield for opportunity. Rustin Lippincott, who moved from Nauvoo, Illinois, in 2007 and is now FACC executive director, applauds the mayor’s leadership. See KRUU FM’s Tanner & Moore Dream Green show featured in The Iowan Magazine Jan/Feb 2012 issue: The energy of two inquisitive minds fuels on-air conversations in Iowa, about Iowa: page 1 and page 2. Maharishi University of Management‘s Sustainable Living Center is featured in the current March/April 2012 issue, under [potluck] titled Beyond LEED, on page 10. http://www.iowan.com. To find out more about Fairfield and neighboring Maharishi Vedic City, visit http://discoverfairfield.org.